To manage removed or closed orders, follow the steps given bellow. 1. 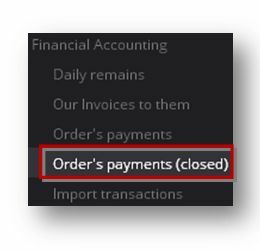 Navigate to the Financial Accounting - > Order’s Payments (Closed) option in the Side Bar. The Order’s Payments (Closed) page will be displayed. 2. To remove orders, check the order record that you wish to remove and click on the Removed Orders ( ) link. The selected order records will be removed. 3. To sell orders, check the order record that you wish to sell and click on the Sell Orders ( ) link. The selected order records will be sold.